Mr. M. wrote a number of letters and prepared the corresponding envelopes. He then put the letters into the envelopes at random. How many letters will be in the correct envelope? 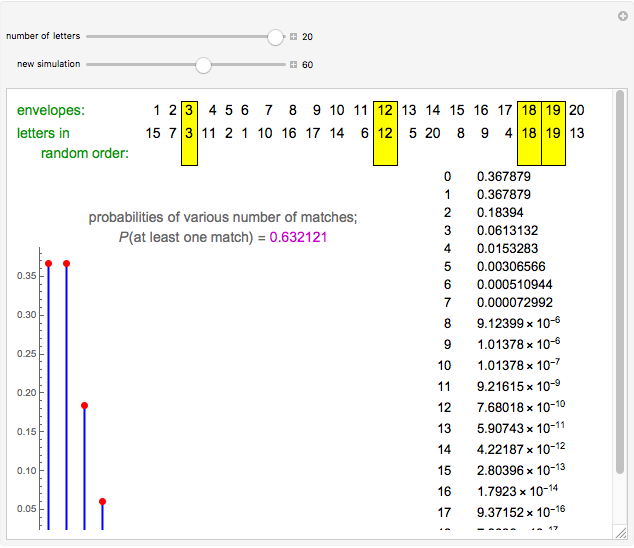 The Demonstration shows the results of this experiment and the exact probabilities of the various numbers of correct matches. 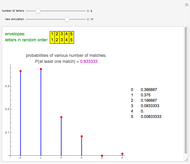 Snapshot 1: With five letters, one experiment gave five matches, which has probability only about 0.8%. With letters, exactly matches is impossible, because the letter must also be in the correct envelope. This problem has various names that contain words like Montmort, derangements, rencontres, matches, or coincidences; see, for example, [1, pp. 100–101], [2, pp. 68–73], [3, pp. 4–8, 231–236]. It was first considered and solved by Pierre Rémond de Montmort in 1708 and 1713. The problem is often represented, as here, by randomly putting letters into envelopes but also, say, by randomly giving hats to their owners. The expected number of matches is always 1, irrespective of the number of letters. The variance is also always 1. 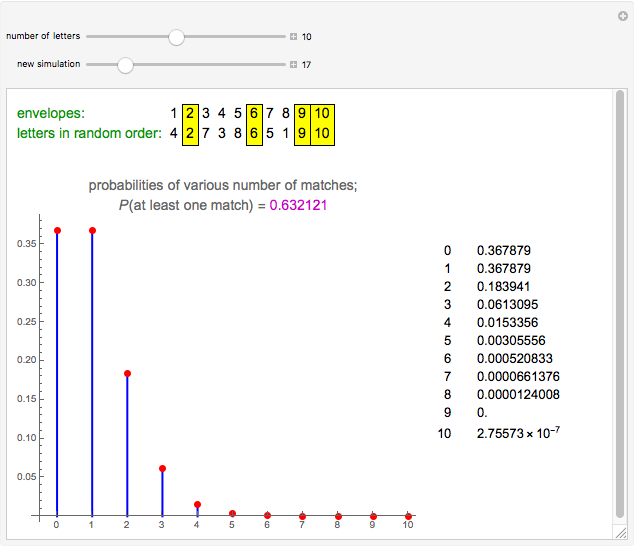 The probability of at least one match approaches the value . 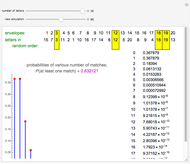 Already with five letters, the probability of at least one match is 0.6333, quite close to the limit. 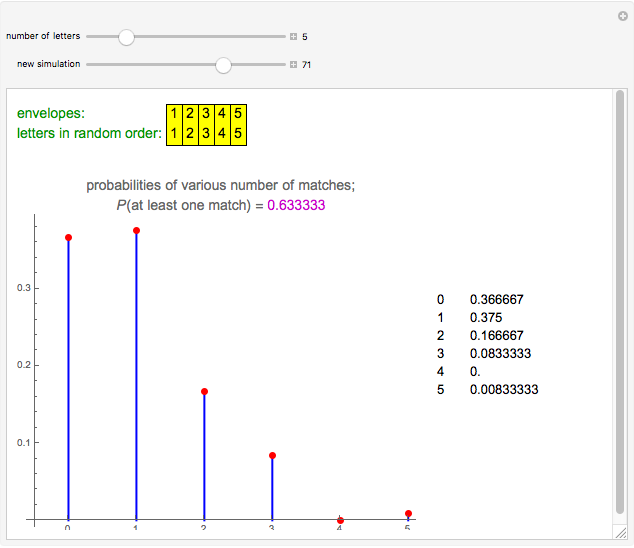 With five or more letters, the probability of at least five matches is very small. 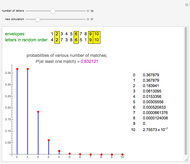 The distribution of the number of matches approaches the Poisson distribution with parameter 1. W. Feller, An Introduction to Probability Theory and Its Applications, Vol. I, 3rd ed., New York: Wiley, 1968. F. Mosteller, Fifty Challenging Problems in Probability with Solutions, New York: Dover, 1987.